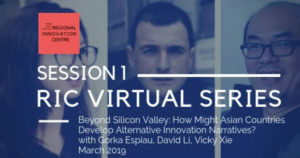 RIC Webinar Series #1: Beyond Silicon Valley. Can Asian countries develop an Alternative Innovation Narrative? FYI-Want to be a step ahead of the game? Or perhaps connectivity is an issue- please feel free to watch part of David’s background context talk here in advance of the live session! 2- what are some of the emergent trends that are on the horizon? What are the game changing features of tech or social dynamics that are influencing the direction in how society is evolving in the innovation space. 3- what are the policy implications for Asian countries that want to develop their own approach to innovation? What processes and instruments can they use? For the launch of the RIC Virtual Series we wanted to explore alternative development and innovation models- especially for the Asian context. We hosted Gorka Espiau Idoiaga, Senior Fellow – Agirre Center for Social and Political Studies and David Li and Vicky Xie, of the Shenzhen Open Innovation Lab to offer a reflection on the experience in Basque and Shenzhen – one that explores very different models to “do” innovation, that builds on the strengths of the specific contexts. https://www.szoil.org/wp-content/uploads/2019/01/logo-3.png 0 0 seth https://www.szoil.org/wp-content/uploads/2019/01/logo-3.png seth2019-04-02 01:48:392019-04-18 11:10:42RIC Webinar Series #1: Beyond Silicon Valley. Can Asian countries develop an Alternative Innovation Narrative?